In September and October of 2001, five giant squid washed up in one area of the coast of Spain. In October 2003, another four giant squid were found dead. Both incidents occurred near boats that were using air guns for geophysical research, producing high-intensity, low-frequency sound waves. It can get pretty loud in the ocean, between shipping, operations to explore and drill for oil, and naval activities. In the past, naval sonar blasts have been linked to large-scale whale strandings; the beached whales had bleeding in their ears and brains. 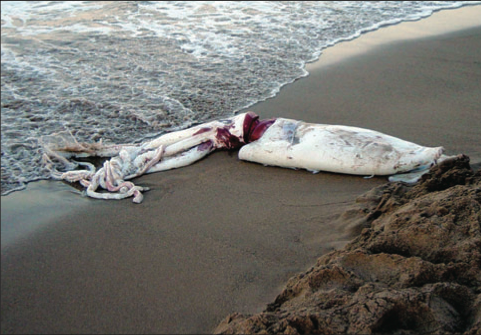 So could sound be to blame for the strandings of giant squid? Whales are mysterious enough; there's a lot we don't know about their behavior, including what exactly leads them to beach themselves after a so-called acoustic trauma. But giant squid are even more mysterious--they're rarely spotted alive. It was only recently confirmed that squid can hear. Nevertheless, a group of Spanish scientists set out to study acoustic trauma in cephalopods (squid, octopuses, and cuttlefish--which is to say, inkfish). They captured 187 common (non-giant) cephalopods. Of these, 87 were put in tanks and blasted with sound at around 157 decibels for 2 hours. For reference, 160 decibels can rupture a human eardrum. After the noise exposure, the squid were decapitated--some immediately, and the rest at intervals up to 96 hours later. The scientists then microscopically examined the animals' statocysts. These are complex structures that help squid control their position and keep their balance. The statocysts may also be involved in hearing, just as our own sense of balance is controlled by a system inside our ears. Across all four cephalopod species in the study, every animal that had been blasted with noise showed damage in its statocysts. And the damage hadn't stopped when the noise stopped: lesions in their statocysts grew worse over time, with the most damage appearing in the squid killed 96 hours later. The 100 un-blasted squid that had been kept as controls showed no damage. Still, the study shows that loud underwater noises can cause dramatic physical damage to the statocysts of squid, and that these organs are probably responsible for hearing, in addition to balance and positioning. Though most cephalopods aren't as cute or endangered as most whales, the types used for food are economically important--and it's nice, in general, to avoid needless mass killings. If cephalopods are this vulnerable to noise pollution, there could be countless other species suffering that aren't as visible to us as a washed-up giant squid.